On 24 Mar 2014, a free seminar on ‘Travel Health Advices for Cruise Travellers & Cruise Seminar” was held at the FMSHK Lecture Hall. 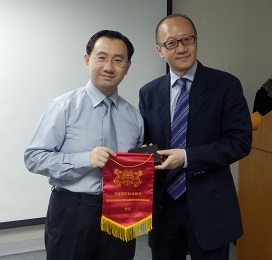 The Federation was glad to have Dr Pang-yung FAN, Founder Member of the Faculty of Travel Medicine, RCPSG, UK to deliver a talk on travel medicine. Dr Fan updated the latest on pre-travel vaccination, medication and international requirements. Another talk was given by Mrs Nancy CHUNG, Asia Regional Director of Carnival Corporation HK Ltd on cruise travel, covering the cruise history, and the selected luxury itineraries and life style on board. A short quiz with lovely gifts was also held at the end of the lectures. As cruise holiday is becoming a hot trend for holidays, the Federation is delighted to organise this seminar for our professionals, with delivery of the necessary health information and precaution in travelling abroad, especially in the prevention of vector-borne diseases, the theme of World Health Day 2014.